I’ve stumbled upon a new kitchen show that some of you might not have found yet. The show is from a chef out of Toronto who owns multiple units with multiple concepts and employs multiple chefs to do the elbow work. 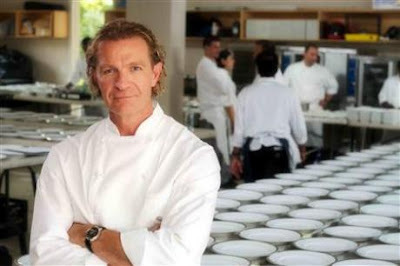 Mark McEwan is the celebrity chef on hand and his antics are great! The food that comes out of his kitchens looks great. It’s speaks volumes to pricey over-garnished dishes that leave you hungry yet star struck. Chef McEwan does a great job of motivation, and I’ll give him credit for organization, but his Egyptian cotton chef coat isn’t going to lose a crease, let alone get dirty. The show is compelling though. I’ve been sucked in and want to see what happens at the catered wedding, or the Winterlicious week, or the steak cook off. There are enough interesting shots of the kitchens and plated food to keep any foodie interested. In a good way Chef McEwan and 'The Heat' lacks the ‘annoying’ factor that chases me away from most kitchen shows. You can find the show on The Fine Living Network at 11 am, or online here. I hope you find the show as enjoyable as I have.